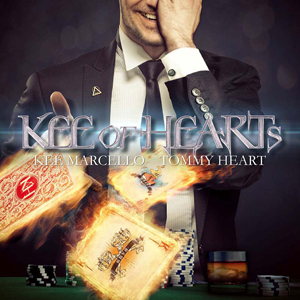 Frontiers Music srl, is pleased to announce KEE OF HEARTS, another collaborative vision by Frontiers' President Serafino Perugino and overseen by the unstoppable Alessandro Del Vecchio! The debut album by KEE OF HEARTS will be released on September 15, 2017. Checkout the first song and video, “A New Dimension”, to be released from the album, on KNAC.COM HERE. KEE OF HEARTS is a new band built around two true melodic rock superstars: Tommy Heart, singer of FAIR WARNING and Kee Marcello, former EUROPE guitarist. With a line-up rounded out by Ken Sandin (ALIEN) on bass and Italian drummer Marco Di Salvia (PINO SCOTTO), the guys started working on the album in late 2016. With their songwriting strongly focused on melodic rock songs, the album came to completion under the direction of producer Alessandro Del Vecchio (REVOLUTION SAINTS, HARDLINE, JORN). It covers a wide spectrum of styles with much attention given to crafting great hooks masterfully played by musicians that know how to deliver the goods! Musically, the band operates in a territory defined by Scandinavian AOR meeting German melodic hard rock with influences from the classic U.S. AOR giants (think GIANT, JOURNEY, etc.). All in all, another unbeatable melodic rock release from Frontiers!